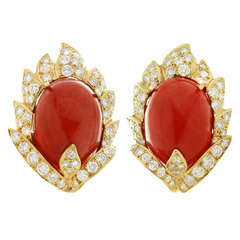 Make a dramatic statement with these spectacular earrings by Neiman Marcus. The earrings feature full-cut diamonds weighing an estimated 4.60 carats, enhanced by carved turquoise cabochons, set in 18k yellow gold and completed with 14k yellow gold clip-on backs, Marked with serial number and NM for Neiman Marcus. Posts for pierced ears can be added upon request. Made in United States circa 1970s. Measurements: 0.90" (23mm) width, 1.45" (37mm) length.